Download our guide to EPIC STRATEGY. 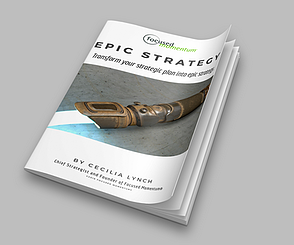 This guide will help you transform your next strategic planning effort into epic strategy. Classic storytelling structure to strengthen business strategy development. An intuitive verses incremental planning approach to deepen strategic thinking and define the gap to cross during your "hero's journey". The failure rate for strategic plan implementation is horrendous. They currently hover in excess of 80%, and that is an improvement! These statistics are shocking to me. At Focused Momentum®, our clients consistently achieve their strategic goals a year ahead of their strategic plan. This guide provides you with some of the key reason why our approach delivers such a different results.